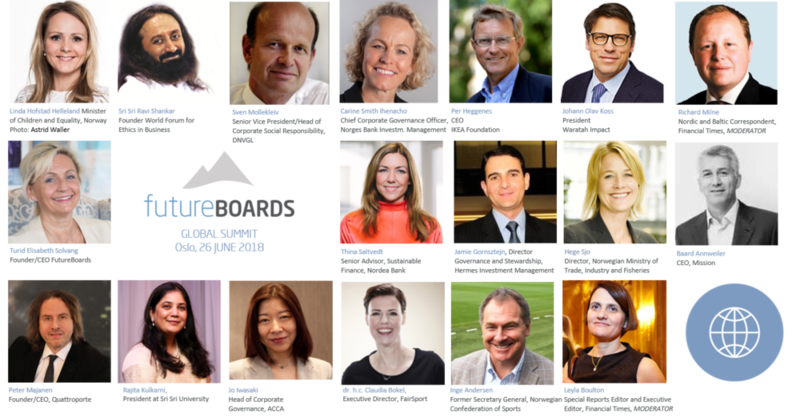 The FutureBoards Corporate Governance Summit is an annual event designed to gather insight, inspire ideas and raise attention for corporate governance. We bring together local and global voices of leaders, investors, CEOs, board chairs, politicians, regulators and academics to exchange insights, thoughts and ideas on how business owners and governing bodies can best respond to expectations and scrutiny from stakeholders in order to ensure long-term value creation. We will take a closer look on how investors and boards contribute to achieve the UN Global Compact Sustainability Development Goals. Meanwhile, flying in on the banners of sustainability, responsibility and long-term value, along come new perspectives on the purpose of companies that re-define their role in society. Higher expectations of responsibility are therefore placed on the shoulders of company owners, boards and management, which pose fundamental questions about the future work of boards. We may not know what the future brings, but we can be quite certain it will be different. The scope of the challenges we face means that the changes will affect both the composition of boards and the way boards work. FutureBoards Breakfast from 8.00am - 10.30am. Please find program here. FutureBoards MasterClass from 2.00pm - 6.00pm, followed by a cocktail reception. Please find program here. – Just talking, or actually walking the talk? – Drivers of change, or back-seat drivers? – Activists, influencers and agenda setters? We would like to extend a warm thanks to Founding Member ACCA Global, supporters Scandinavian Executive Institute, Sustainability Hub, Chitra House and Thought Leader Global as well as to our media partner BoardAgenda.